The Black Women Bike group proclaims that bikes aren't just for "young white hipsters." … that being able to try new things is a form of privilege. Biking in the city is already daunting for some people; single parents who work at jobs that don’t include health insurance or sick days may– with good reason– think twice about taking risks they cannot afford. 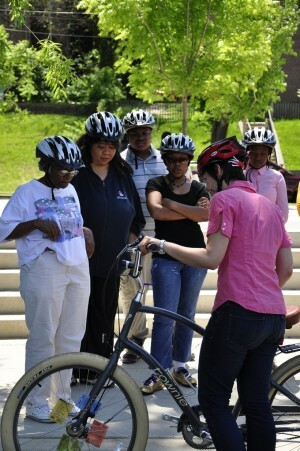 Students listen to WABA instructor Sarah Miller explain how to check a bike before going for a ride. About 10 people mounted pedal-less bikes and coasted downhill in front of the Anacostia Library on Saturday. Once they had their balance, they earned one pedal. Then, two. Within an hour, almost all were riding bikes, thanks to two Washington Area Bicyclist Association instructors. Some of the students in WABA’s adult riding class, like 59-year-old Mary Buckley, hadn’t been on a bike since childhood. 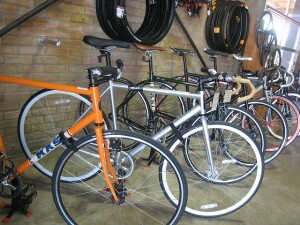 Others, like 32-year-old LaStar Matthew, had never learned how to ride a bike in the first place. Over the past three weeks, WABA has offered free classes instructing adults on how to ride bikes and how to ride them confidently in the city. But usually whenever the organization advertises such classes, which are enormously popular, “our core contingency follows us,” WABA executive director Shane Farthing said. People from Northwest D.C., or even Maryland and Virginia, fill up the classes rather than the Ward 7 and 8 residents the classes are intended to serve. So this time around, WABA limited its advertising to posting fliers and other materials around the neighborhoods where the classes were to be held. And it worked: although the turnout was comparatively low, as expected by WABA, the participants were mostly from the neighborhoods. The last class had the highest turnout. Matthew saw a flier posted at her bus stop. Others found out at the library or via word-of-mouth. The outreach is part of Farthing’s goal for the year. He wants to push bike advocacy in Wards 7 and 8, and WABA is doing it through grassroots methods such as these classes, setting up mobile bike shops and sending bike “ambassadors” to ride daily East of the River and encourage cyclists living in the neighborhoods.